The public's desire for a living, breathing Sherlock Holmes was satiated as new forms of media brought him from the pages to the stages - in London, New York, Hollywood and Paris. What follows from the links below are the stars, dates and episodes that thrilled audiences in dark cinemas and warm living rooms. Those episodes marked with a small green square are available today, while those without are very regrettably lost to the ether. 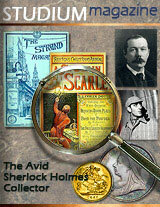 Sherlock Homes was first portrayed on film by Danish actor Alwin Neuß in 1911, but a series of adventures along the lines of Doyle's work did not appear until Eille Norwood's excellent rendition of the sleuth opened to movie audiences in 1920. Presented here is a listing of actors and their film series that brought this 'novel' character to life. Basil Rathbone's portrayal of Sherlock holmes moved easily from film to radio, with weekly episodes calling to the ears of eager listeners from the comforts of their living rooms. Through the following decades, several gifted actors carried on as the voice of the emminent detective. Clicking here will take you to the actors, dates and titles of works from the wireless, with a few clickable examples for your listening pleasure. 1954 brought Sherlock to brand new television sets across the country, with actor Leslie Howard's son playing the key role. Three decades later, Jeremy Brett aptly filled the detective's shoes in a handsome series very true to the Doyle stories. Here you'll find more in-depth information about these televised adventures.